I purchased this 4-cup Duchess China teapot with matching creamer and open sugar bowl at a china shop in Stratford-upon-Avon. I was looking for something with pink. I like the delicate pink floral pattern with a touch of green and blue. It is called "June Bouquet", very appropriate I thought, since I purchased it in June! I had a couple of interesting discussions with shopkeepers at 2 different English china shops. According to them, there is very little china being made in England. Both gentlemen carry only English -made China and question how much longer they will be in business this way. According to the local newspaper, prior to our visit Royal Worcester announced their entire operation was moving off-shore. They plan to keep a retail shop open in Worcester. One evening on the BBC news, there was mention of china being made off-shore and labeled as if it were made in Staffordshire. Warehouses had been raided and the china had been confiscated. I must admit, this makes vintage English made teapots and teacup and saucer trio sets more appealing to me! 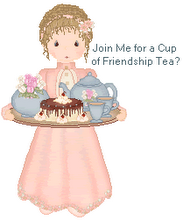 hi linda your China teapot is beauti full ,nice idea ,you have very beautiful blog!